Number lines are wonderful tools. Simple, elegant, and useful to everything from beginning to count, to categorizing number groups, to helping students make sense of irrational numbers. So, naturally my mind started racing when my daughter handed me this. 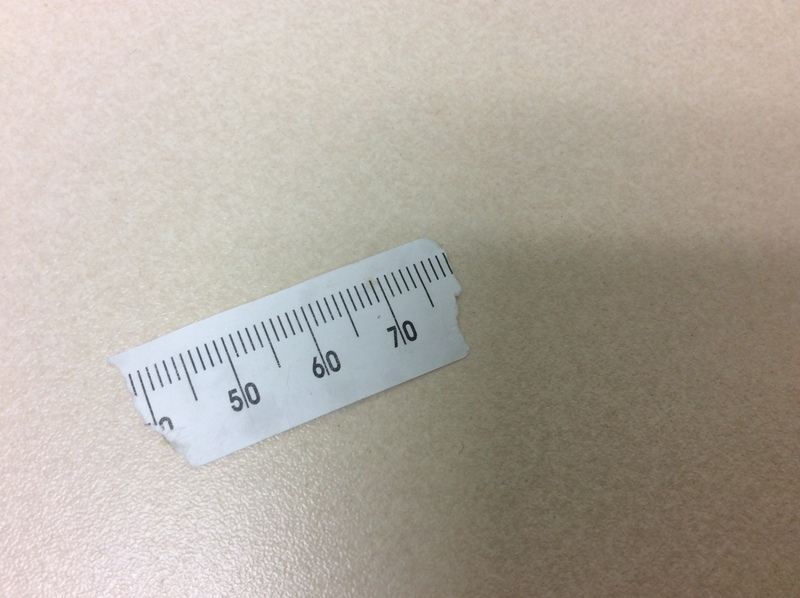 I think she intended for me to throw it away, but, sticking to the old adage “One man’s trash is another man opportunity to integrate several pieces of instructional tech to create a delicious opportunity for young people to learn mathematics” (Paraphrased), I decided that this was just to powerful a tool to chuck. So, I thought 3-Act. The problem is, unless I’m extremely resourceful, I don’t have enough for an Act III here, so I switched to a different number line. Okay, so let’s start estimating the locations of some missing values. To give it a bit of context, I placed the number line scrap on a grid on Desmos. 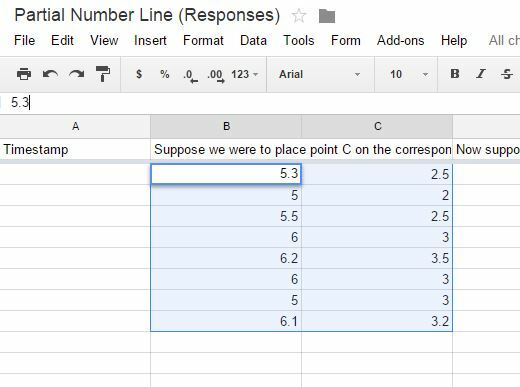 Then, to collect the data, I created a Google Form for the students to enter their estimated coordinates at points 100 and at 55 in the missing portions of the number line. … and paste it into a new line in your Desmos graph. Then, once they feel like they’ve come up with answer they like a bunch, you can reveal to them the answer. You may also choose to re-paste their estimate points so they can see how well they did as a group. I like activities like this because it provides ample opportunity for focused guessing, collaboration, and a variety of solution processes. It also asks a pretty simple question at the beginning, which helps to include everyone, regardless of level. 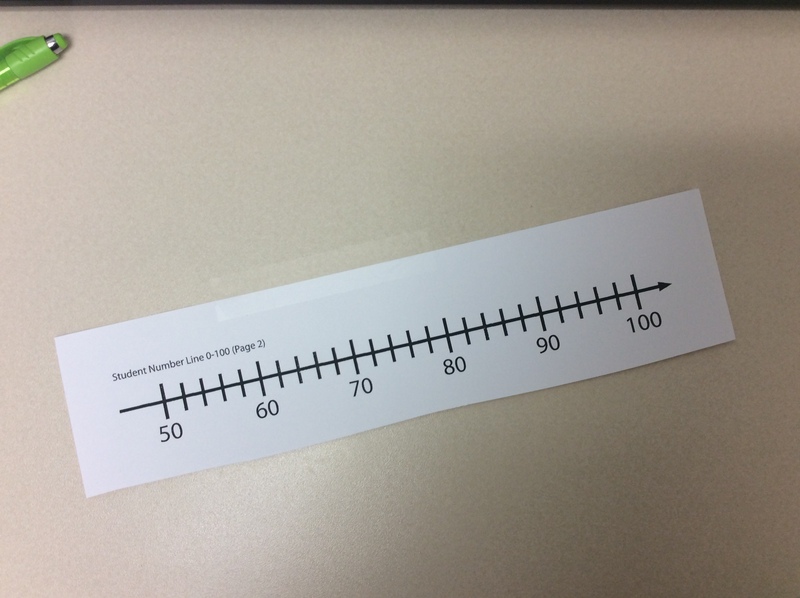 It just seems the longer I’m involved in math education, the more and more functional uses I’m seeing for the number line. Now that I’ve taken a few steps forward into this world of instructional technology, I’ve been able to step back and reflect a bit. All these devices/apps/tools seem to fit into two very broad categories: stuff that helps us do stuff we already do better and stuff that allows us to do stuff we previously couldn’t do (or at least couldn’t realistically do). and while I feel like those are important distinctions, they tend to both get brushed aside as “reinventing the wheel”. And it makes sense. Teachers are resourceful people. They are pretty good at recognizing what they need and finding solutions to make it happen. Teachers generally don’t spent time reusing tools/processes that don’t work or don’t provide value (based on the values that teacher has). B. something that give the teacher the ability to do something they don’t currently do. And they aren’t really wrong. This is where those of us to are inclined to consistently seek innovation need to recognize the value of creating “intellectual need.” This idea was first introduced to me by Dan Meyer being applied introducing new processes and tools to math students, but I think there are pretty solid parallels to sharing new technologies or processes to teachers. The idea is that as long as the learners have tools or processes that work fairly well for them, they won’t value learning new tools or processes. To get around this with students, teachers can introduce a new problem-type or content to create a need for a new tool or process. You can administrate the need. With teachers, it’s not quite as simple as that. Teachers have the ability to shield themselves in a lot of different ways from the changing conditions. Teachers are flexible. In this case, the task of creating need for a new tool isn’t administrative. Teachers need to see the potential for the new tools. They need have the new processes modeled. They need to see the vision of where this could take them and their students. We need to be out of the business of process-sharing and into the business of idea-building. What would you like to do that you can’t do now? What do you do now that you wish worked better? Let me show you some cool classroom action that got me excited. It’s can’t be about the tools. It needs to be about the vision for the classroom. If they already have a wheel, they don’t need a new one. 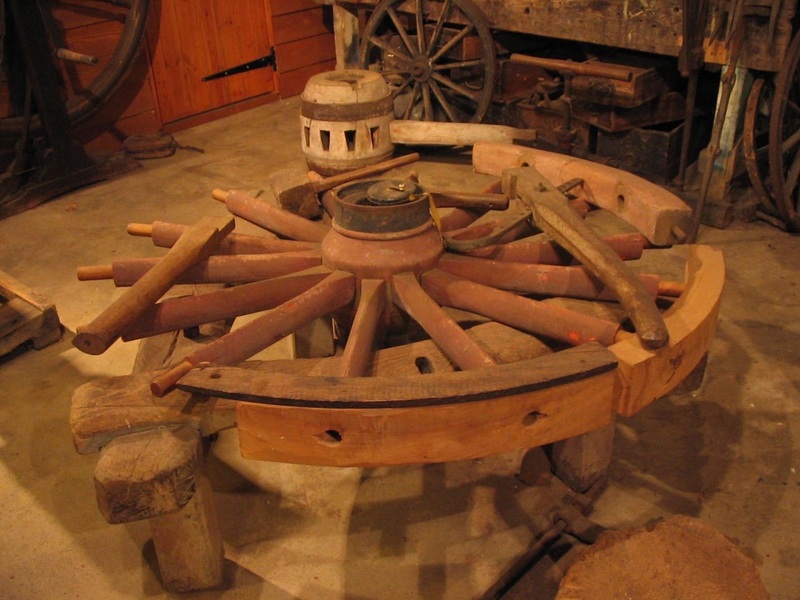 But perhaps with this or that new tool or process (whatever it is), that wheel that’s already been invented can take the students farther than they’ve ever gone before. Today, I attended the MiFlip Conference at Steelcase University in Grand Rapids, MI. I was going for a variety of reasons. I need people to explain flipped learning to me. I need skeptics to be skeptics. I like to fly-on-the-wall discussions where advocates and skeptics collide. Not because I enjoy confrontation, but because Michigan has some wonderful educators (check out #miched if you want to get a taste) and I figured that this particular collection would be unmasked, open, and willing to both be skeptics and advocates. First, I want to mention Matt Roberts (@mmcr) from Grand Valley State University who brought this with him as part of his presentation. 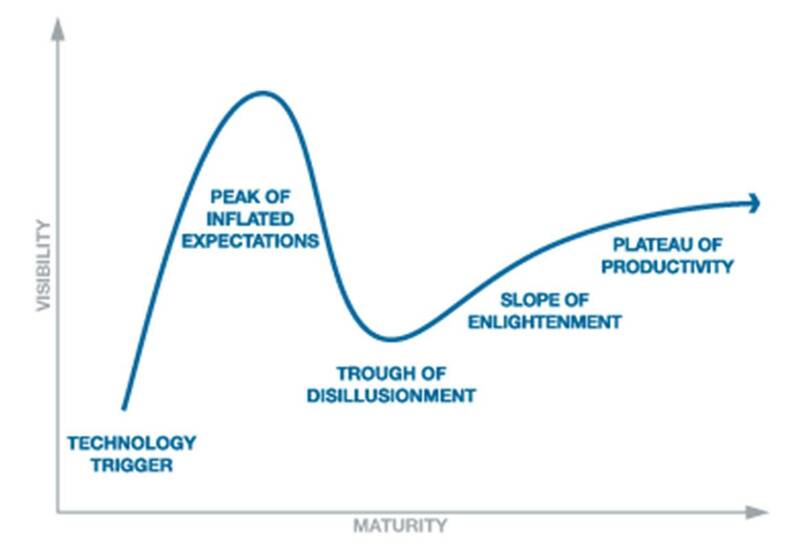 This is “The Hype Cycle”, which I recognize from a variety of innovations over my relatively short career in education. I’m certainly not trying to talk down the people who are excitedly sharing their experiences and enthusiasm about flipped learning. It’s just that there’s some things that have always made me hesitant about fully advocating flipped learning and Matt helped me make sense of some of them. I feel like he did a nice job of expressing why he think flipped learning needs to be looked at holistically. He led an awesome session on the realities of learning in a flipped model and understanding what we are asking these students to do… which is, in some cases, something they’ve never been asked to do before. When we lead students through a flipped learning model, we are asking them to take ownership of their learning in ways that might be new to them. They need to self-regulate. They need to recognize their confusion and use that sense of mental discomfort as a motivation to get that issue resolved with the variety of resources the teacher has made available or that the internet as a whole has to offer. This goes even further when we push blended learning to the next level and start (as was so excellently described by Anne Thorp (@athorp) ) expanding the options to include flexibility in assignment contexts, due dates, and formats. There will be an adjustment period if students have only known educational worlds of note-taking, rigid due dates, and common assignments. That forces us to help the students become comfortable with the learning process. And many of them will need help. The try-fail-improve-try-again model can be a frustrating one for kids who aren’t really accustomed to failing. Besides that, as Matt brought up in his discussion, things like sleep, nutrition, and exercise play a pretty significant role as well. Regular review, making connections and effective practice have to become things that get built into the curriculum. Flipped learning is more holistic than other instructional models because it so often looks at the hour that the class spends together as merely an important part of a larger learning process. Many students are raised in education looking at the hour that the class spends together as the whole class. Effectively managing that transition is vital to ensuring that students are experiencing the best that flipped learning has to offer. The teacher looking to embrace the flipped learning model needs to recognize that they are taking on more than simply restructuring their assignments. They are likely redefining learning to students who may not have entered their class expecting that type of experience. Thanks to Dan Spencer (@runfardvs) for giving me a one-on-one tutorial on Camtasia. Totally needed it and it totally worked. I appreciate the energy that Anne Thorp brought to the table. (I’m not the only one that is saying that, either, by the way.) Our paths are going to cross a number of times in the future and I am very excited about that. And, in a much less academic way, I’m thankful to Tara Becker-Utess (@t_becker10) for being willing to drive the carpool from Dimondale, MI (about an hour east of Grand Rapids). In my last post, I attempted to make a case that teachers are given too little time to do all their jobs well. It’s one thing to say that. But one glance at the state of education will reveal that finding that time is going to take more than a smile. But there’s a difference between difficult and impossible. I’ve said before that teachers would likely do a better job if they only taught half the school day, but even I’ll admit that we are a long way from something like that being possible.However, if we are going to find this kind of time, we need think about changing structures and systems surrounding instruction and assessment and in that, I think there are some fairly reasonable opportunities. 2. We can also start getting creative with our incentives. How about a contractual addendum that states that any teacher who mentors and chairs a committee or a department gets an extra time during the school day without students? Stipends are nice, but we need to talk about time. This starts to change the conversation. There is a lot to like about putting teachers in charge of curriculum committees, data committees, school improvement teams, and mentorships, but we have to respect that we are altering their job descriptions when we do that. They are no longer “teacher”. They are “teacher/district-level consultant.” and time should be built into the work day to complete the work of each of those roles. That is, if we really want them done well. The rise of instructional coaches should make this transition a little bit easier. 3. How about hiring a part-time, quality, substitute teacher to work 3 full days per week? (How about a retired teacher?) This teacher could get “signed out” like the media center or the COW cart, by any teacher who needs an hour to do school work. Maybe a couple teachers need to sit together and do data analysis. Have coverage available for those teachers, if the work is important. If that option isn’t there, the choice falls to either doing after hours (leading to exhausted teachers), doing it poorly (which diminishes the potential positive impact) or not doing it at all (which leads to authoritarian decision-making by school leaders). This work can get done. I will agree that teachers have the ability to really influence an improvement in education. Whether or not we see that influence realized will depend on if we want our teachers to do a lot of work, or if we want our teachers to do great work. My Hopes for Education in 2015 – It’s about time. 2014 will be known to me as the year that I left the classroom. I left it for a variety of reasons. Not the least of which is that teaching is exhausting. It is tiring in every way that work can be tiring. It’s emotionally tiring. Teachers are constant fighting for goals that aren’t attainable. Even the most idealistic, optimistic, and resourceful teacher in the country will admit that expecting 100% of your students to reach their top learning potential is ridiculous. But that’s the goal. And it’s the perfect goal to have. The problem is that it isn’t ever going to be reached on a large scale. Which means that teachers are going to constantly be faced with failure, with students who aren’t going to make it. They are going to craft lessons that flop. They are going to hear students reject their favorite ideas. This happens regularly. When 100% is your goal, 90% will work. It’s not perfect, but it’s darn close, but what happens when that 90% is actually 39%. Like, it’s not that your students got worse. They didn’t. They are what they’ve always been. You were just always told 90% were proficient and that was totally false because only 39% of them actually were. How on earth is someone supposed to cope with that reality? This is tiring, tiring work for practically everyone who does it. And the incentives for excellence are purely internal for each teacher. There isn’t a lot of upward mobility. If you are a great teacher, you’ll be asked you do more, like chair committees and departments, mentor younger teachers, lead professional development sessions, these are good things. But they take time and they are hardly compensated appropriately based on the time commitments. Besides, there comes a time when money isn’t really what’s needed. What teachers need is time. Time for research. Teachers are smart people. They can understand all of the confusing (and ever-changing) requirements for retirement, PD, certification. It just gets a little tricky when they are doing all of this research after supper. When they should get a chance to turn their brains off. Time to analyze. Reading adolescent body language is tricky, tricky business. Using data to tell if your lessons work is a lot more reliable. But it takes time, because lessons rarely 100% work or 100% don’t work. Completely scrapping a lesson is a fairly quick process. Tweaking a fairly effective lesson is where real effort and energy are involved. Looking at the data to figure out where the lesson worked, where it didn’t and then updating it effectively can be a time-consuming exercise. It should be a time-consuming exercise, because there should be time to do this necessary work. But there isn’t. And yet, as we move forward with reforms, we are still asking our teachers to do more and more and more and giving them less and less time to do it. One district laid off all their elementary art and music teachers and asked the classroom teachers to provide art and music education. Classroom teachers, already pressed for time, are being asked to spend larger amounts of time with students in their classrooms AND develop and deliver new lesson plans. While taking away time, they are being asked to do more. What does success look like in a situation like that? In 2015, I hope to see this tide start to turn. To understand that teachers NEED this time. They need it. They can’t do their jobs well without it and for us, as a community of motivated, highly-qualified educators need to start helping drive the creative processes that will help create time for the people who need it. I have some ideas, in my next post I will throw out a couple of ideas. Please share your ideas. We need all the good ideas we can get. You know, flipped learning is a precarious structure. In some sense, it seems quite progressive, empowering to the student, allowing the student to take ownership of his/her own learning. In another sense, though, it replaces live teacher lectures with video-recorded teacher lectures, which actually seems like a backwards step. Clearly not all instructional models that include videos are created equal. Now, I have been an advocate of a while of using video to enhance instruction, if for no other reason than that a properly-chosen, properly-timed video can grab students attention really well when they are tired of interacting with me and with each other. However, videos largely have the problem of being passive activities for the students. I’ve tried a variety of different things to attempt to add some interactivity to videos. There’s the ol’ pausing-the-clip-every-90-seconds-to-engage-the-students-yourself technique. I used this move when I taught physics. “Hollywood Physics” was where we’d watch a clips filled with delicious energy transformations or breakdowns in Newton’s laws. Lots of pausing and discussing. I’ve also used tools to try to embed questions that break the video up and make the students reflect or predict. This little ditty from 2011, The Bowl Problem, although not my best work, reflects a desire to try to create a video that has some interactive elements to it. That was created with a digital camera and PowerPoint. It was prohibitively time-consuming. There has to be a better way. And Zaption might be it. I’m not a spokesperson for these folks. In fact, they are not the only service out there that embeds interactivity into videos (Educanon and Bubblr are two others). I just found Zaption to be the easiest to use and the most useful as a formative assessment tool. You don’t get to see your results, which will bother some, but the results are tallied and shown in a series of well-made reports that has the potential to inform a teacher about how students engaged the video (it shows how long the video was watched, how many times each questions got skipped, etc. ), and give you some insight as to their understanding of the content. It’s not a perfect tool. If you wanted to use it in an actual quizzing/grading type set-up, the grading of the results might be a little tricky. Additionally, this, like every bit of instructional tech, has a learning curve. Having said that, though, I found that choosing the right video to practice on was the slowest part and that the process of creating the questions to be pretty easy to pick up. Flipped learning has its critics (I have been among them at times), because there is a demand for instructional technology to get implemented meaningfully. Instructional technology isn’t a savior. However, the effective use of instructional technology does have the potential to make a huge dent in some of the improvements we need to make. We want it to give us a chance to do things that we previously had to work too hard to do. Tools like Zaption help make a previously passive activity, like watching a video, potentially more active for the students and informative for the instructor. Since posting this, I’ve received a tweet about an additional software to embed instructional items into videos. And since I’m mentioning Zaption, Educanon, and Blubbr, I figured it was only fair to add this one. I’ll just show you the tweet.